As the competition for the presidential ticket of the opposition Peoples Democratic Party gets stiffer in the run-up to the 2019 general elections, the party has said that it will rely on Nigerians to help the party choose its candidate for the presidential election. The National Publicity Secretary of the party, Mr. Kola Ologbondiyan, in an exclusive interview with the Media on Friday, said the party had heard that many people, including a former Vice-President, Alhaji Atiku Abubakar; Senate President, Dr. Bukola Saraki; Sokoto State Governor, Aminu Tambuwal; his colleague in Gombe State, Ibrahim Dankwambo; and a former Governor of Kano State, Rabiu Kwankwaso, were interested in picking its presidential ticket. He, however, said the decision to rely on Nigerians was premised on the party’s determination to avoid past mistakes, impunity and imposition of candidates. According to Ologbondiyan, the party is not backing any of those in line to get its presidential ticket. Others interested in getting the party’s presidential tickets are a former Minister of Education, Ibrahim Shekarau; former governors of Jigawa State, Sule Lamido and Ibrahim Turaki; and a former Governor of Sokoto State, Attahiru Bafarawa. 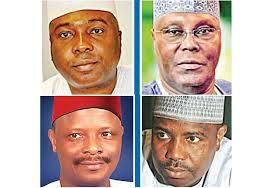 He said, “As a party, we have so many candidates already, but Nigerians will determine their next president. “Nigerians are desirous of change; there is no argument about that. And it is more than obvious that the APC is bent on presenting President Muhammadu Buhari for a second term. The party does not have any other alternative. So, Nigerians desiring change can’t get it in the APC. They are looking at the PDP. We don’t want to disappoint them again. “There are so many demands in the country now. Some people are agitating for restructuring, some want a leader with experience, not somebody that will get to power and wait for another six months before appointing ministers, some want young people. All of these factors will come to play in selecting our presidential candidate. He added, “Currently, there are debates over the age of who should be our President, whether the President should be young or old. Therefore, there are so many aggregations of opinions, so what Nigerians say about the kind of candidate they want will inform our choice. Since President Muhammadu Buhari declared his intention to seek re-election in 2019, there have been discussions in political circles about who can successfully challenge him at the poll, especially in the opposition parties. In a bid to challenge the ruling APC, the PDP and no fewer than 30 parties had recently formed a coalition in readiness for the next general elections. Called the Coalition of United Political Parties, the collaborating parties and associations had signed a Memorandum of Understanding to jointly present candidates for elective positions. However, this has not stopped some members of the PDP from signifying interest in getting the main opposition party’s presidential ticket. Meanwhile, sources in the PDP have told Saturday PUNCH that the recent defection of Tambuwal and Kwankwaso has altered political calculations among some members of the party. It was learnt that with the two leading politicians’ interest in the presidential ticket of the party, the number of strong contenders for the party’s ticket from the North-West had increased to five. The North-West, which arguably accounts for the highest number of votes per zone, is Buhari’s traditional political stronghold. The zone is home to seven states, the highest number in Nigeria’s six geo-political zones structure. A top ranking member of the party, who spoke on condition of anonymity for fear of retribution, said, “Before now, the former Jigawa State Governor, Sule Lamido; his former Kaduna State counterpart, Ahmed Makarfi, and a former Minister of Special Duties, Tanimu Turaki (SAN), were the most visible contestants from the North-West. Until Tambuwal’s recent defection, the PDP had no sitting governor in the entire zone. However, the arrival of Tambuwal and Kwankwaso in the picture has renewed PDP’s confidence of giving the APC and its candidate a good fight. Authoritative sources within the PDP told the media that Tambuwal had consulted widely on his presidential ambition before his decision to dump the APC, on which platform he was elected governor in 2015. Some of the sources, who were privy to the workings within and outside the party, said Tambuwal was being considered as a possible candidate because of his age, educational background, cosmopolitan nature and experience. It was gathered that the former Speaker’s experience in the legislature was also being considered as an added advantage as he was initially to challenge Buhari for the APC ticket in 2014, but had decided to contest the governorship of Sokoto State. Kwankwaso, who was second only to Buhari during the 2014 APC presidential primary, is being considered as someone that could pose a threat to Buhari’s re-election bid. The former Kano State governor has however left the decision about his political future in the hands of the party. Kwankwaso’s spokesperson, Binta Spikin, said, “I don’t know about that (presidential ambition) because now that he is in the PDP, it is for the party to decide whether it will hold a primary or adopt a candidate. Another source in the PDP, who also spoke on condition of anonymity so as not to be seen as taking sides, said, “The candidate that the PDP needs is someone who has the capacity to deflate the support base of President Buhari (especially) in the northern part of the country. However, Director of Media and Publicity, Atiku Presidential Campaign, Mr. Segun Sowumi, expressed confidence that the party would see what his principal is to offer and give him the chance to be its presidential candidate. One of Saraki’s loyalists in the Senate, who also spoke on condition of anonymity because he was not authorised to speak to the media, explained that the Senate President was under pressure to join the presidential race. But when contacted, his Special Adviser on Media and Publicity, Yusuph Olaniyonu, said he did not know the lawmaker’s political aspiration. “I cannot answer the question (on his presidential ambition), it is only he (Saraki) who can do that,” he said.